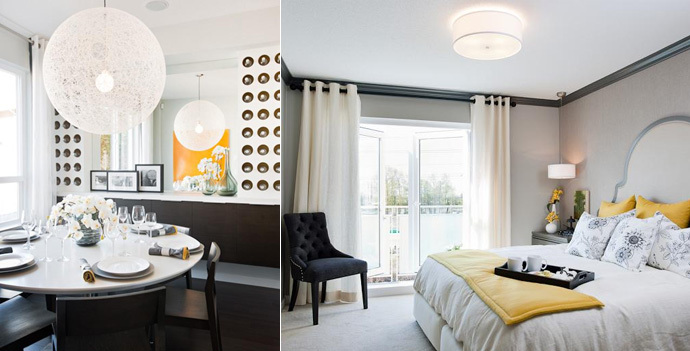 The Vancouver Condo Buzz » From $379,900 > Farrington Park Coquitlam Townhomes at The Foothills of Burke Mountain Community > Polygon’s Coquitlam Farrington Park Townhouses with 3 Bedrooms Launching! From $379,900 > Farrington Park Coquitlam Townhomes at The Foothills of Burke Mountain Community > Polygon’s Coquitlam Farrington Park Townhouses with 3 Bedrooms Launching! Parkside Living in Coquitlam is now here! Brought to you by Polygon Farrington Park Coquitlam townhomes is a very limited collection of finely crafted Coquitlam Parkside townhomes in the Foothills neighbourhood of Coquitlam’s prestigious Burke Mountain community. Cotswold-inspired architecture and modern open floor plans are signature features of the new Burke Mountain Coquitlam Farrington Park Townhomes by Polygon and they are just steps away from the new urban conveniences and natural mountainside amenities that families and couples can enjoy year round. One of the best features of The Foothills of Burke Mountain Coquitlam Farrington Park townhomes for sale is the price point with 3 bedroom homes starting from just $379,900. To register, please visit www.polyhomes.com today and click on the Farrington Park townhouse link. The Farrington Park townhomes on Coquitlam’s Burke Mountain will be released for sale starting on Saturday, September 15th at 12 noon. Here, prospective homebuyers can preview the project offering with 3 bedroom homes starting from just $379,900. This is an exciting opportunity for families and couples alike, so don’t miss out! NEW INCENTIVES FOR 2013 at Farrington Park Coquitlam Townhomes! Why wait? Visit us soon to take advantage of today’s great buying opportunities. As a reminder our sales centre is located at 1338 Hames Crescent in Coquitlam and open daily from noon-5pm (except Friday). The display homes for the newest Foothills of Burke Mountain Coquitlam real estate development community by Polygon will be situated at 1338 Hames Crescent Coquitlam BC. The parkside townhouses at Farrington Park Coquitlam are attractively priced three bedroom residences built by a leading developer that has completed over 2500 homes in the Tri-Cities area alone. A home at the Foothills of Burke Mountain Coquitlam Farrington Park townhouses will offer you peace of mind knowing that all of these spectacular residences are built with extreme care and dedication by Polygon. The limited collection of finely crafted Farrington Park Coquitlam townhouses features a central location in The Foothills of Burke Mountain, a prestigious community of luxury homes. The homes will be situated very close and within walking distance to the future Meridian Crossing retail centre with a new kindergarten school as well as many new schools around the area that are top ranked in the province. Also, the new Coquitlam Farrington Park townhomes will feature a close proximity to the spectacular Burke Mountain Trail system as well as being across from Galloway Park itself. Here, families with children can find a splash pad, sports court and children’s playground for year round fun. The Farrington Park by Polygon Coquitlam townhouses at The Foothills of Burke Mountain community will have striking and beautiful Cotswold-inspired architecture with stately brick and steeply pitched roof line accents in addition to beautiful exterior living spaces. Inside the homes at Farrington Park townhomes will be flexible and functional layouts for today’s families as well as 3 amazing colour palettes that were professionally hand selected for you in mind. The ensuite bathrooms will feature spa inspired rain shower heads as well as double vanities and contemporary flat panel cabinets. Also, the kitchens are luxurious with granite or engineered stone counters, stainless steel KitchenAid appliance package and much more. Refined yet contemporary, every homebuyer at the Farrington Park townhomes in Coquitlam’s Foothills of Burke Mountain will be extremely happy with their purchase decision. Priced from under $380k, this limited collection of 3 bedroom Farrington Park Coquitlam townhomes features an ideal Foothills Burke Mountain location and spectacular architecture that is English Cotswold inspired. From the meandering pathways, waterpark and playground at Galloway Park nearby to the picnic tables and basketball court, the centrally situated Polygon Farrington Park Coquitlam townhomes at the Foothills of Burke Mountain neighbourhood is an ideal place to raise a family or to just enjoy the peacefulness of this forested setting. Also, residents will be just steps away from hiking and biking trails in addition to excellent transit routes, commuter routes, shopping and new schools in the area. 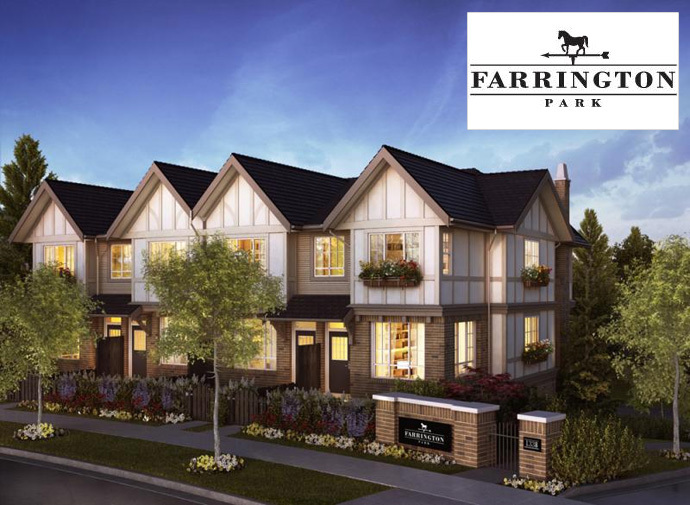 Coquitlam’s Farrington Park by Polygon is a new collection of three bedroom townhomes reflecting refined English Cotswold-style architecture with steeply pitched roof lines, stately brick cladding and window boxes. Modern interiors at the Polygon Farrington Park Coquitlam townhomes for sale feature open-plan layouts, luxurious ensuites with granite or engineered stone counters, and gourmet kitchens with granite or engineered stone countertops, warm laminate flooring, and sleek stainless steel appliances. 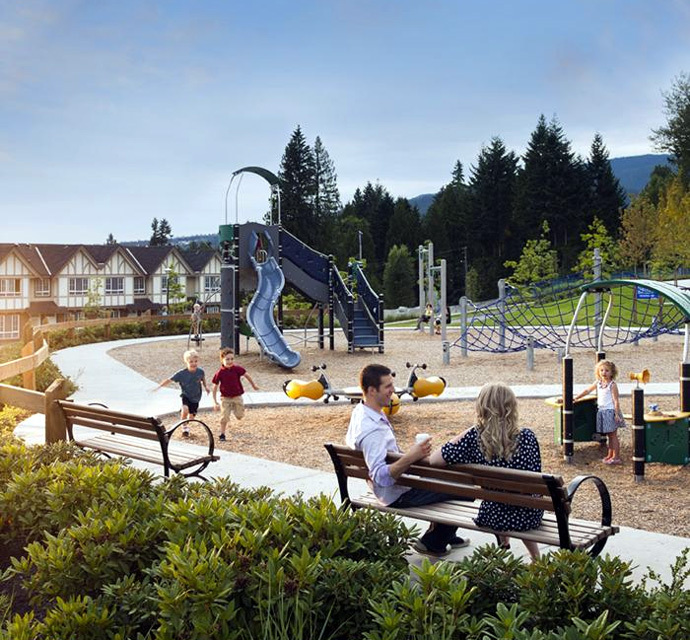 Situated in the heart of the new Foothills of Burke Mountain neighbourhood, Farrington Park Coquitlam by Polygon is next to the beautiful Galloway Park with charming park bench seating and meandering pathways set in a large grass field, complemented by lush landscaping. With a waterpark and splash pad, a playground with slide for children, basketball court and picnic tables, this expansive park has something for everyone.